Published March 24, 2014 at 640 × 449 in Peru. Lost City 48x36 In 2005 I took a spiritual journey to visit the sacred sites of Peru, The most magnificent place was Machu Picchu; a 15th-century mountain settlement in the Amazon region. (one of the seven wonders of the world ) I could feel its powerful energy pulsating through my body as meditated at areas of the ruins. 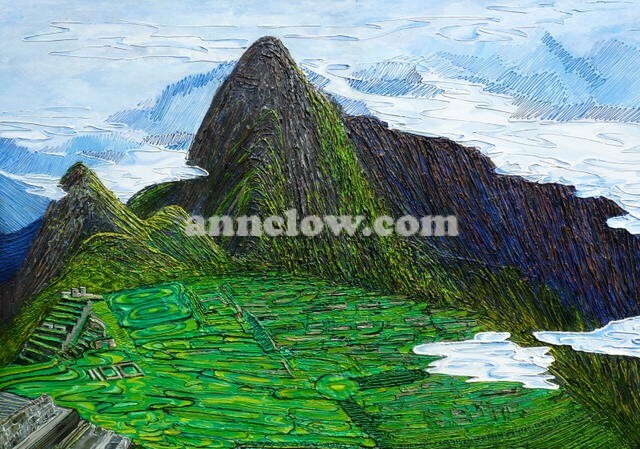 When I started having dreams, in 2009, of Machu Picchu, I knew it was time to take my brush and capture its energy and beauty.